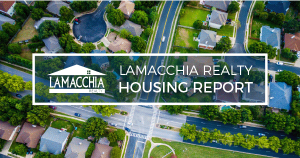 The Lamacchia Housing Report presents overall home sale statistics and highlights the average sale prices for single families, condominiums, and multi-family homes in Massachusetts and Southern New Hampshire for May 2018 compared to May 2017. It also looks at other metrics in Massachusetts like Homes Listed For Sale and Homes Pending, as they are often the best indicators for predicting future trends in the market. Massachusetts home sales increased just over half a percent from 8,428 in May 2017 to 8,482 in May 2018 with increases in condos and multi-families. Single families decreased in sales by 2% from the year before. 5,396 were sold in May 2017, compared to 5,288 this year. Condos increased by 4.57% with 2,340 in May 2017 to 2,447 in 2018. Multi-families increased by 7.95% from 692 in May 2017 to 747 in 2018. Overall, prices increased by 6.77% in May 2018, from $413,988 in May 2017 to $442,029. Prices increased in all three categories; multi-families by 9.11%, from $432,830 to $472,277. Single-family prices increased 7.82%, going from $452,201 to $487,577 and condos increased by the least amount, 3.97% with prices moving from $343,125 to $356,757. In May 2017 12,639 homes were listed for sale in Massachusetts compared to 13,754 in 2018, showing 8.82% increase. This depicts the market swinging into balance, as more homes are becoming available to all the buyers out there. There were 11,429 homes that went pending in May 2017 and 11,223 in May 2018 showing a 1.8% decrease. Homes aren’t flying off the market as quickly as they have been now that more sellers are listing, and buyers have more to choose from and can be less competitive. 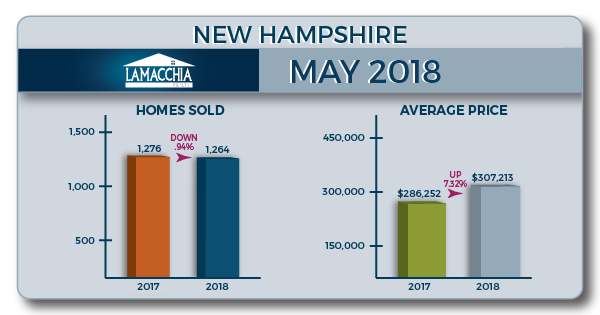 The number of properties sold in Southern New Hampshire decreased overall by .94% from 1,276 to 1,264, with decreases in single families and multi-families. Condos saw the only increase of 14.08% going from 341 sales in May 2017 to 389 last month. Multi-families family sales decreased by 26.32%, now at 42 from 57, and single families decreased by 5.13% down to 833 now from 878 last May. The average price for homes in New Hampshire increased by 7.32%. Multi families saw the largest increase of 9.17% going from $284,118 in May 2017 to $310,172 last month. Single-family prices increased 7.58%, now at $328,706 from $305,545, and condos increased by 5.86% from $247,931 last year to $262,462 this year. Our predictions in last month’s housing report that the market will hit more of a stride, and that buyers will see selection and sellers can be less concerned about where they’ll move if their homes sold quickly are coming to fruition as this May’s numbers have shown. The number of listed homes is up and pending sales is down, showing that buyers have more selection and that they’re taking their time to make an offer as the competition diminishes. This is the time of year, albeit later than usual, when the seller’s market and buyer’s market meet in the middle for a short time. Anthony discussed the market shift in his two most recent market update videos, watch by clicking here. The inventory increase is shifting the scales a bit for buyers and sellers and he explains why.